Mattern Family: A four year old little boy and great art! A four year old little boy and great art! I am amazed at the difference a great book with great art can make on a little boy! 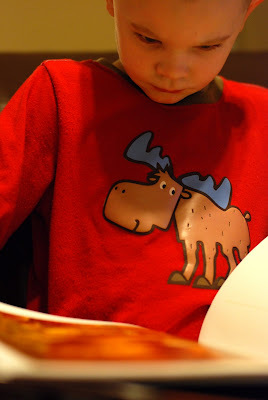 My girls have always loved books but then my little boy came along and things changed a bit! My sweet four year old son is not much of a sit still kind of fellow! You can imagine my surprise when I came home with our library bag full of The Story of the World literature suggestions... he sat starry eyed and captured! This is another little blessing or "kiss" from God telling me that this is the right journey that we are supposed to be on! Oh the wonderful adventures we have ahead of us! I love being on this journey with you! My boys are the same way! They are busy, busy, busy, but put a book with great art in front of them and they are mesmerized! We are doing SOTW 1 also, we LOVE IT! I don't have a library down the road, but I tried to order a bunch of the books at the beginning of the year. We are having so much fun...I hope you are too. From looking around here, it looks like we have a very similar philosophy of education! Such sweet pictures! Thanks for stopping by and leaving a comment... it was nice to meet you!